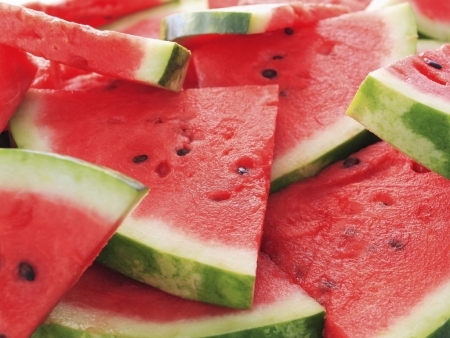 Watermelon is a delicious and refreshing fruit that contains almost 90% water. Moreover, it is packed with potent antioxidants that help neutralize free radicals. As it has a cooling effect, this fruit is considered excellent for summers. It comes in over 1200 varieties with red, yellow, orange or white colored flesh. Some of the most popular varieties are Carolina Cross, Orangeglo, Cream of Saskatchewan, Yellow Crimson Watermelon, Densuke Watermelon, Moon and Stars, etc. When choosing a watermelon, look for one that is smooth, firm (but not too hard), and free of bruises and soft spots. Ripe watermelons are usually faded on the top. Watermelon is native to Africa. It is produced in most tropical and subtropical regions of the world now. This plant belongs to the Cucurbitaceous family. Watermelon has thirst quenching properties. Plus, it has anti-inflammatory, antioxidant, demulcent, vermifuge, febrifuge, purgative and mildly diuretic qualities. Apart from the pink flesh, juicy watermelon rind also has several health benefits. For instance, it can heal acne breakouts and improve blood circulation. Regular consumption of fresh juice extracted from this fruit, which is loaded with lycopene, protects against heart disease. In addition, it reduces the chances of developing cervical cancer, lung cancer, prostate cancer, colon cancer, and certain other types of cancers. Moreover, studies have shown that higher levels of lycopene avoid damage caused by exposure to sunlight. Furthermore, watermelon works as a good hormone regulator. Plus, it strengthens immunity and helps reduce the severity of asthma. Watermelon aids in weight loss as well as it helps the metabolism work efficiently. It can prevent the formation of kidney stones, too. Intake of this amazing fruit benefits in soothing burning sensation caused by mouth sores and ulcers. Being rich in carotenoids, watermelon assists in lowering high blood pressure. It helps in flushing out toxins from the body and reducing uric acid concentration in the blood. This fruit is also useful for healing mild erectile dysfunction as it contains citrulline that helps relax blood vessels. Consuming this fruit can serve as a natural cure for increasing libido, too. Here’s an interesting video showing how to prepare watermelon juice. In addition, watermelon protects the eyes from age related macular degeneration, glaucoma and other similar ailments associated with the eyes. It is good for brain and relieves symptoms of depression and nervous anxiety. Besides, it works as an efficient home remedy for bedwetting. In terms of nutrition, watermelon is considered good for health because it is rich in vitamin A, vitamin C, vitamin B1, vitamin B6, magnesium, potassium, thiamin, and so on. Though sweet still, it is beneficial for diabetes patients. Plus, it is good for individuals suffering from osteoarthritis and rheumatism. • Eating this fruit on a daily basis during the summer season helps avoid heat stroke. Being rich in electrolytes, it prevents dehydration. 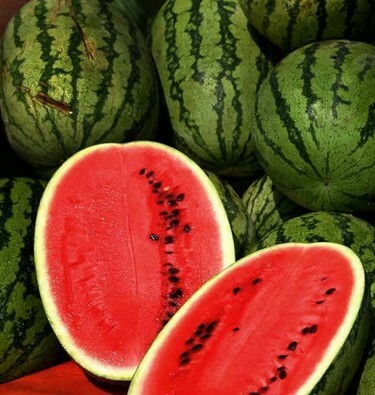 • Consuming watermelon rind relieves heartburn and morning sickness during pregnancy. It also reduces muscle cramps. • Boil a handful of watermelon seeds in water until the solution becomes thick. Drink this decoction on an empty stomach, first thing in the morning to get rid of intestinal worms. Follow this therapy for a few days. • Dry watermelon seeds under the sun for a day or two and boil two teaspoons of these seeds in a cup of water for about an hour. Cool and strain the solution. Drink this home medicine to reduce blood pressure. • Drinking watermelon seed tea can prove to be useful in dealing with urinary tract infection. 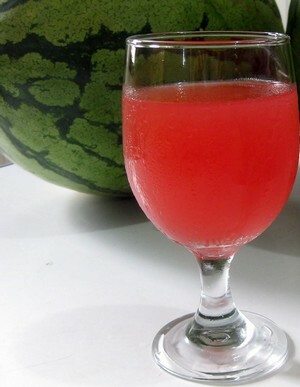 • Having a glass of watermelon juice in the morning, on an empty stomach provides relief from headache. • Watermelon seed oil benefits in the natural treatment of rickets. • Consuming watermelon seed tea cleanses the kidney and bladder. To prepare this tea, pour two cups of hot water over a tablespoon of ground watermelon seeds. Leave the solution for 15 minutes and then strain it. Drink this tea daily for about three days. This therapeutic tea also helps dissolve kidney stones. • Eating slices of watermelon mixed with a little black salt cures dry cough. • Simply eating this fruit for a few days relieves constipation. • Rubbing a piece of cold watermelon can heal skin sores. • To treat acne naturally, rub watermelon rind on your skin on a regular basis. In addition, consume this fruit as well as its juice. • Applying watermelon juice on skin for about 15 minutes helps avoid wrinkles as it tightens the skin. • Regularly using a combination of watermelon pulp and yogurt on skin serves as a natural remedy to exfoliate the skin and fade blemishes. You can also blend a mixture of watermelon, yogurt and banana, and apply it as a face mask for 15-20 minutes to get glowing skin. • To get rid of blackheads and avoid sunburn, apply a combination of grated cucumber, watermelon juice, tomato juice and sufficient rice flour to form a paste. Wash it off after 10-15 minutes. Roasted watermelon seeds can be eaten as snacks or sprinkled on salads. You can also make watermelon seed tea or include the seeds (ground) in soups to reduce the risk of developing cardiovascular disease or type 2 diabetes. These seeds are high in protein and low in carbohydrates. Moreover, you can pickle or marinate the rind of this fruit after removing the green part. Watermelons do not cause any significant side effects as long as they are taken in moderation. Excessive consumption of this fruit, however, may lead to hyperkalemia, especially in individuals suffering from kidney disease. It may trigger allergic reactions in those who are prone to celery, cucumber or latex allergies. A very nice site for good healthy guidance .